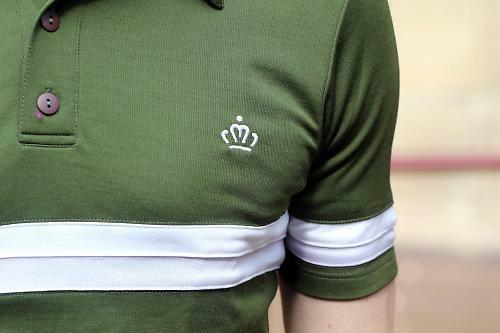 Road Holland takes inspiration from the jerseys worn by the likes of Bartali and Coppi for their European retro style Den Haag top and what a looker it is. With the danger of every ride becoming a training ride it's nice to just kick back and go out for a spin sometimes. The Den Haag puts you in that kind of mood. The polo shirt styling and neat buttoned rear pockets don't shout 'racer' or even 'cyclist' so it looks just as good off the bike as on. The three-button neck adds to the casualness and provides a decent amount of venting should things get a bit warm. It's a quality garment, you can feel that straight away. 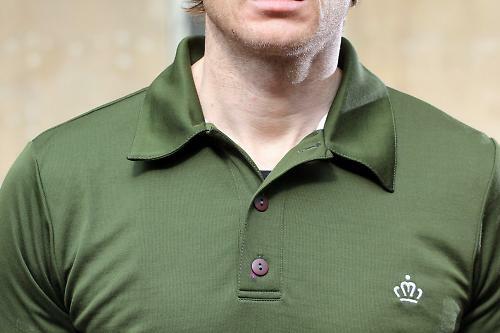 The Merino and polyester mix is super soft against the skin while the detailing and neat stitching go some way to justifying that £73.00 price tag. The embroidered chest motif and Road Holland logo on the rear pockets adds a certain touch of class. There is a range of four colours (the lilac is my personal fave) and sizing from XS to XXL so there's plenty of choice. For reference the medium fitted me spot on with a 32in waist and 38in chest. Merino is a brilliant material and even though it only makes up 39% of the blend you do still get a lot of the benefits. The insulating properties of the wool means you stay warm in the cold and cool when the sun comes out. It's fast wicking to so should you put the hammer down and get a bit sweaty you and the jersey will both dry quickly. Add that to the fact Merino is anti-bacterial and you won't need to be washing it after every ride; I managed to get a week of commuting out of it before it needed a freshen up. The pockets are deep and strong enough to take a phone, keys, couple of tubes etc. and thanks to the button closure everything is secure. You don't get any sag either although things can tend to bounce about a bit if you're really spinning the pedals. On the bike it's best suited to a more upright position because the rear isn't dropped like most cycling jerseys but the rest of the cut is tailored, keeping excess material from flapping about. It's still a relaxed fit though. It's not just a commuter or café run jersey, though. The Den Haag can be used for sportive riding or fast placed club runs. It's quite thick so I'd say it's best suited to spring, autumn or cool summer days if you're really going to ramp the effort up. Things can get a little toasty at max effort. 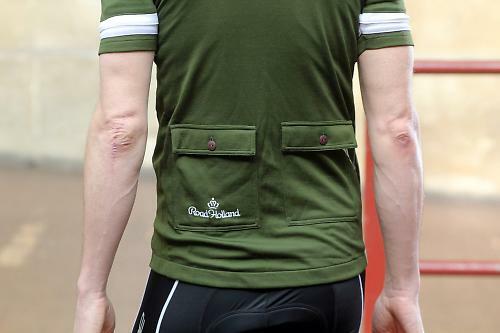 Overall the Road Holland jersey is a beautiful bit of kit that makes you feel good when you slip it on. The fabric is soft enough to be worn directly next to the skin and you don't get any of the scratchiness associated with some (typically cheaper) Merino garments. The quality is really top notch and so far seems to be very hardwearing after about 300 miles of riding with a heavy rucksack in places. All the buttons are easy to do up and undo while on the fly and are still as secure as when the top was new. Looks, styling, comfort and quality are all at there in abundance, I can't see much to find fault with. The perfect top for those sunny café spins and back lane meanders. Performance with a bit of class. 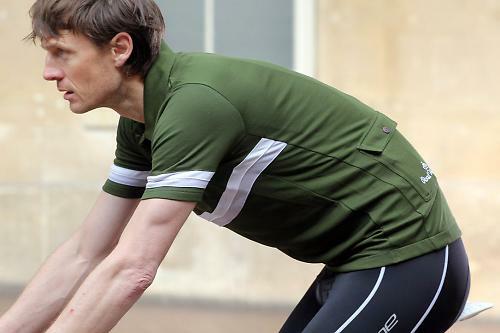 It's a more relaxed jersey for the non racer for those easy days commuting or just spinning round the lanes. Road Holland say it's about old school style with new school materials which I think is pretty much spot on. Nice but not sure I would spend £73 on a soft polo shirt with pockets. It's nice, but is there anywhere in the UK that you can actually buy it? As far as I can tell you need to get their stuff from the website, and then there is a $30 delivery charge for everything, and you have to pay the return costs if it doesn't fit. Excuse the blatent plug, but my business, Velotastic sells these in the UK. Excuse the blatant plug, but my business, Velotastic sells these in the UK. Nice site. Didn't order the jersey but did get a couple of cycling caps for the summer. Quite a few eyesores in those vintage jerseys! Like that they are US Brand..
Retro is fine but buttons, really.. They are impractical with gloves and always fall off! But as it's a summer jersey most of the time surely you'll be wearing mitts so they shouldn't be that much of a problem. I did a big ride in a buttoned jersey last year and doing them up and undoing them wasn't a problem - and believe me, manual dexterity is not my strong suit. More of an issue for some might be that on a hot day you can only open three buttons so far unlike a modern jersey with a full length zip. Mind you, that didn't seem to bother them too much back in the days before cycling jerseys had zips. Or maybe it did and they were just stoic about it. No Team Z jersey though. Have to admit I ordered one, it arrived today from Memphis! and looks great- cold wash only though. Just right for a retro Genesis Equibrium rider.